Kareo Adult Protective Underwear (Pull-Ups) is a product manufactured by Rian Healthcare. Adult’s pull-ups are easy to pull up and pull down like the regular underwear. The Pull-Ups feature added for stretch expands the waistband and tear-away sides for removing easily. • Easy to pull up and down like regular underwear. • Pull-Ups trait added to stretch waistband and tear-away sides for removing the pant easily. • It provides a snug fit and looks similar to regular underwear. • Added with an ABSORB-LOCK in core so no need to worry about odor control. 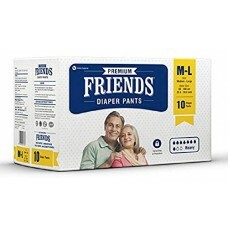 • Brief kind of leg openings protects against leakage Friends adult Pullups addresses both types of incontinence urinary and bowel. • Suitable for both Active Men & Women. Friends Adult Protective Underwear (Pull-Ups) is a product manufactured by Nobel Hygiene Private Lim..